Beekeeping! It’s a great hobby. And if your bees do well (which isn’t a guarantee), they’ll eventually get a bit crowded. See that thing hanging down? There’s a new queen growing inside. Photo by Migco. Then the old queen and half of the worker bees leave the hive in search of a new home. A swarm of bees looks terrifying! Thousands of them in a big clump–it seems like you’re under attack! Swarming bees are searching for a new home. Because they don’t have a hive to defend, they’re unlikely to sting, and they have absolutely no interest in you. Scout bees check out potential places, using a special dance to report back with their findings. Once a good spot is located, the swarm relocates there. Now as a beekeeper, you don’t want your bees to move on. You want them to settle in one of your hives. So when a hive swarms, you don your protective outfit, get some helpers and go collect those bees. How? 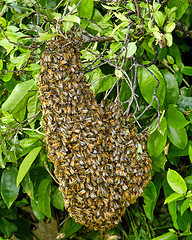 Well, in my experience, one person stands under the swarm with a hive box, while another gives the branch a good shake, hoping the queen and enough workers land inside that they’ll settle. Somehow, I always wound up as the person holding the box. No, I don’t have pictures (this was in the days before everyone had a camera phone, and we were far too busy to be snapping photos). But you can imagine what it’s like. It’s warm outside, a bit sweaty under all those layers (even if they are white). You’ve got a heavy wooden box balanced on your head and you’re just waiting for the bees to land. What’s taking so long? You peer out to see what’s going on and realize they’re about to go. You duck back under, bracing yourself for impact. You set the box down and get a lid on it, hoping you got the queen. Because if you did, the workers will begin to build comb and the colony will stay. But if you didn’t, you’ve lost the swarm. It was sort of like this, but with a much bigger drop before they landed on my head, er, in the box. I have a book in the Scholastic Book Fair! First book signing! | Alison Pearce Stevens on New outdoor classroom–now in! Copyright © 2019 Alison Pearce Stevens. Powered by WordPress. Theme: Spacious by ThemeGrill.